Caring for your self-healing cutting mat is easy. Every now and then you will want to take a little scrubber (like the kind used for dishes) and brush off your mat to release any loose threads that get caught. You don’t need to rub too hard, just a light touch is sufficient. To soak your mat, place it in a bathtub or container that is large enough so your mat can lie flat. Add a solution of ¼ cup white vinegar per gallon of cool water and let it soak for 15 to 20 minutes. Make sure the water is cool! Warm or hot water can warp your mat. This special solution will absorb into your self-healing mat and make it nice and supple again. You can dry the mat with a cotton towel or let it air dry flat. Make sure it’s flat too – you don’t want it to warp as it dries. And that’s it! Easy. Just remember, keeping your mat clean, moist, flat, and away from excess heat will preserve it for years to come. This is a great idea, I ruined my first mat and had to buy another one. 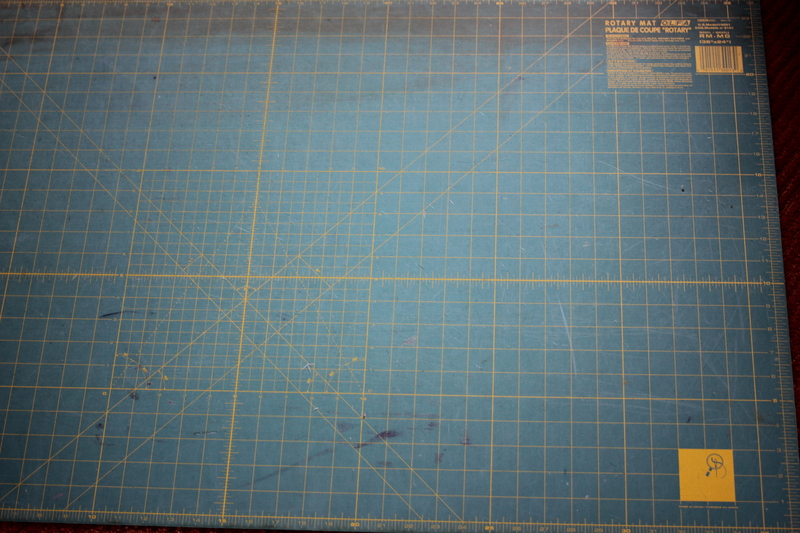 I have a 58 x 33 mat on my cutting table, which will not fit into a tub for a soaking bath. After Any suggestions for revitalizing it? Hi M J. Do you have a children’s pool available? Now would be a great time to pick one up! If you’re like me and live in an apartment…I just went ahead and used the bathtub. I let 1/3 of the mat soak 15, scrub, dry, then put the middle part of the mat in the solution, repeat/dry, then the last third and soak/dry. I didn’t change out the water so to not waste it. What if you don’t have a tub? Is there another way? I have recently purchased a new mat and would like to keep it as new as possible. Thanks for the article! Hi Nancy. Use a child’s pool, just fill it enough to cover your mat. how about plugging your shower enough to cover your mat? A big shallow pan used for wetting wallpaper would also work if you don’t have a kiddie pool. Someone else suggested to get a large garbage bag and to put the solution in the bag and then the mat and then lay it down flat and to fix the opening so that the water doesn’t flow out (tie it and raise it up above the liquid level). 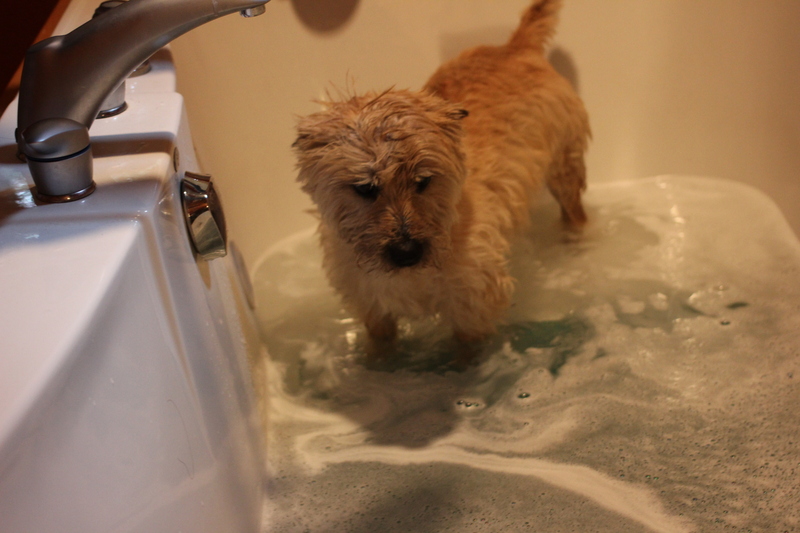 And it seems the dog gets a wash too. Love it and thanks for the tutorial. Hi Katie. I’ve tried many ways to unwrap, unfortunately I am not aware of a way. With that being said, that doesn’t mean there isn’t a way. Let’s see if any of our other experts have an idea. I placed a warped mat on my patio(flat surface) and allowed the sun to heat it. I then placed something flat on top for a day, once mat was heated from the sun and afterwards it was as good as new. This worked for me as well. The mat warped in the hot car and was a mess by the time I got home. I used this method of wetting it and laying it flat on the balcony to dry with some books on top of a towel on the mat. Temp was about 100 in the sun. didn’t take long for it to be as smooth as new! I have done the same with some bricks on top until it cooled down. If I travel with it, it is the first item to go in the car, flat in the boot. No problems since. Thanks! I absent minded and sat a hot dish on mine and wrapped it. I replaced it but I cannot bring myself to throw it away. You can repurpose that wrecked mat. Cut it up and put in the bottom of fabric bags or purses to stiffen them and give it a flat bottom. I had a mat that had been stored standing up and it was badly warped. I soaked it in plain cool water for about an hour and then laid it on my sidewalk in the sun. Amazingly it flattened out perfectly. It took about 2 days in the Florida sun. I used an hot iron. Later it flat with a towel under and a wet towel on top…ironed the wet towel good then piled books on top of the iron part and moved to the next spot. Worked for me. I think it sat for a day or two. I read that on a quilt page. Peta, I found a way that wonderfully fo rme. My mat was really warped IN a hurry one day i slipped my largest mat between my box spring and forgot it . When i took it out i was sure it was ruined, I put on the hood of my car on a hot day. When i got it off the car it was like brand new. Thank you for the info! I did not know that the mat needed moisturizing. I didn’t know this either. But my mat is too big for the tub. Can I just spray the solution on? Hi Linda. You can, but you won’t get the full effect the tub gives. Do you have a children’s pool you can put an inch of water in? I have never cleaned mine. I will. Thanks! I thought I was going to have to buy a new one. I use my gloves (the ones with the little rubber grippies) on the fingers to clean my mat. Just rub over the mat in circular motions and it will remove any pieces of fabric, threads, bits of batting, etc. Then just pull the little matted clump from your glove and you’re good to go. A pencil eraser will clean mat also. Thanks I did not know this, very good info. I had cleaned my mat and let it dry for a few days. Then I put a new blade in my rotary cutter and it cut all the way through my mat. As many years as I have been cutting I’ve never had this happen. Has anyone else? Hi Cheryl. I’ve never heard of that. How long did you soak your mat? I use a lint roller to pick up threads and fuzz from my mat. I just wish I had a bath in this house. Is there an alternative if you don’t have a bath or large laundry trough. Hi Jeanette. Do you have a children’s pool available? If you don’t have a tub or kiddy pool, use a garbage bag! Find a flat spot outside, slip your mat in the bag, add water/vinegar/soap, and fix the opening so it doesn’t spill out. I’ve done this with my oven racks and other flat items and it worked great! Is this method of care suggested for all materials that mats are made of? All brands? I see that you are soaking the very popular brand of green mat. My mat is is a harder surface blue one. Should I soak it? And in the past, I had a translucent white one that eventually develloped places so cut that it became unusable. Would this method of care have prolonged its life? Hi Jan. This method is usually suggested for ‘self healing’ cutting mats. This is due to the fact that those mats need to retain some kind of moisture in order to keep their self healing properties. As for other non- self healing mats, I recommend using the edge of a ruler to push out or brush away bits of fabric that can get stuck down in the cuts of the mat. If you are getting large piece of cuts areas so cut up that they are unusable, it is best to just replace the mat. I would recommend trying to not always cut in the same spot on your mat. For example, if you are repeatedly cutting 4″ strips, don’t always line up the fabric and cut at 4, 8, 12..etc.- instead offset the fabric to utilize different areas of the mat. This can help make it last longer. Was so happy to see how to clean your matts. Had no idea water could be used to soak in w/vinegar. I would not recommend soaking this kind of mat as I am unsure how the pressing mat side would dry. I recommend trying to find care instructions for the specific brand of mat you have. Thank you so much for this information. 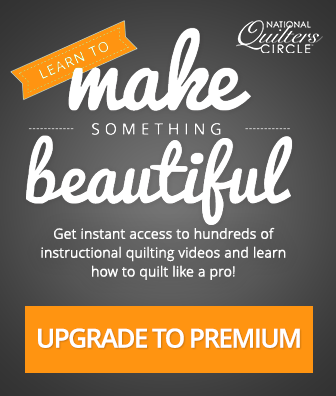 I had no idea and I will be sharing with my quilting friends. You don’t mention how much soap to add. Does it make a difference? How much soap to add depends on how much water you are using. 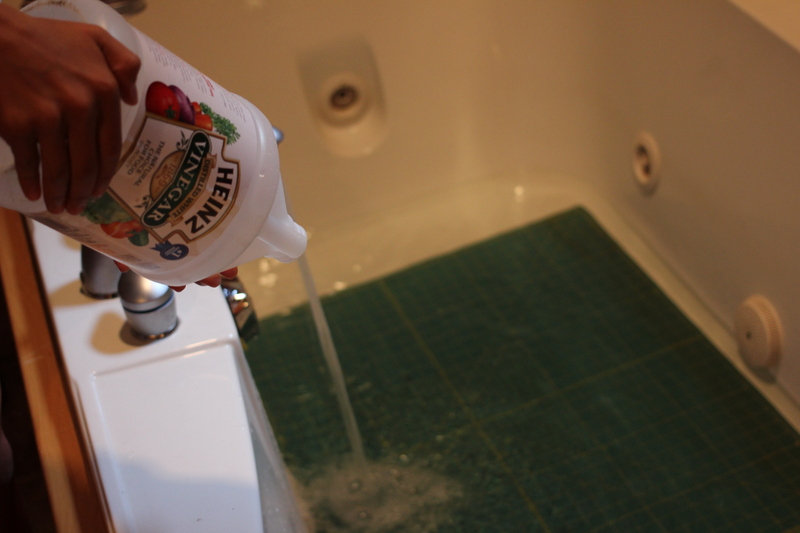 If you are filling a sink or shallow bath, just a few drops is plenty. You do not want to be adding so much that you create a lot of bubbles. I have a Martelli 3-piece round lazy susan cutting mat. The underside is not a cutting mat, its “non-slip”. What is the best way to soak or clean it? Hi. Rather than soak this part of the mat, I would recommend simply wiping it with a damp cloth. I would contact Martelli and ask them how to clean it properly. Their products are very expensive and I would hate for you to ruin it. Thanks, that sure was very helpful. My cutting Matt needed it. Any way you can get a warped mat flat again? Hi, Pat. There are several ways to get a warped mat to lay flat again. First, you can try simply laying it out and seeing if it will “relax” over a day or so. If not, add some weighted books to the sides overnight and see if that makes it lay flat. If neither of these methods work you may need to add a little heat to your mat to get it to lay flat again. I know this may seem counter intuitive, however, you are simply going to be slightly warming the whole mat. The best way to do this is to lay it in the sun for a day and allow it to warm up. Once it warms it will either relax on it’s own or you can add the weighted books back to the sides and allow to to sit for a day. How much soap? Do you rinse it after soap and vinegar bath? I use a pastry scraper to get the fine fuzz off the surface of the mat…found out it works really nifty. Did not know about the soak, wash cycle though..thanks for the info. I have a rotating mat, can it be cleaned the same way? Hi, Lynn. Yes, you can clean your mat the same way, however remove it from the lower pad that allows it to spin. This part shouldn’t need to be soaked anyway. The easiest way to remove ink from anything is……. hairspray. I have used that countless times and it always takes out the ink. No matter if it is felt marker or pen. How often should you do this to your mats? Hi Lesha. You can use the little scrubber to remove threads and bits of fabric any time you find that there are some sticking in your mat. As far as soaking your mat- you shouldn’t have to do that very often. Once in a while, or when you notice it starting to become very dirty should be enough. I have been using the same mat for several years now and have not had to soak mine yet. Hi, when I bought my self-healing mat no one told me how to take care of it and there was nothing on it telling me how the healing part worked or how to care for it. So I thank you for this information. Since I don’t know anything about self-healing mats could you tell me as I haven’t yet done any moisturizing baths, if I do this will the cuts I’ve made go away? Some of mine are pretty deep. Thanks for the great tip! Any idea how often we should be cleaning our mats? Every 3 months, every 6 months; maybe it depends on how often you use the mat? Hi, Luanne. It definitely depends on how often you use your mat. I will lightly brush and clean mine whenever I see lint or bits of fabric starting to stick to it and then only soak it every year or so. Doing small cleanings every now and then can cut down on how often you need to soak your mat. I had no idea! Thank you for the tip. Thanks, I didn’t even think of cleaning it. Great news….I don’t have to buy a new one…they are so expensive! What a good thing to know….thank you again! I lay a damp towel over my mat, especially if I’ve used the same place to cut several times. I leave it until I need to use me mat again. Thank You for the wonderful information about preserving the cutting mat. What do you do if you don’t have an area big enough available to lie your mat flat, what can you do for the moisturizing part? Borrow someone’s bathtub for an hour? Hi, I would like to know which kind of a dish scrubber you are talking about. There are so very many, if you could be specific, I would appreciate so much. Also, a soft brush was mentioned. Again , what kind? Like a nail brush?? Thankyou so very much for your help. I have a piece of rubber that is designed to clean my cutting mat that I use. It was very inexpensive and works great. If you have ever seen the crocheted little scrubbers, they work great too. Any scrubber that you can use on teflon coated pans would work. I would not recommend steel wool, etc. How often should we clean these self healing mats to keep them moist? it depends on how dry/hot your area is and how much you use your cutting mat – the hotter and drier and more often use will require you to do this more often. I would recommend at least once a year as a standard. Also, if you are finding that you are having trouble cutting or your mat is just looking sad and overused, it doesn’t hurt to give it a spa day. Aside from re-drawing your lines with some kind of permanent ink I do not know of any ways to make the marks more visible. I had no idea I needed to do this – thanks for the great information! Cute dog, BTW, ?Norfolk terrier? As a novice quilter with more time on my hands I look forward to any tricks of the trade like maintaining my mat. I had the same question – what kind of dog do you have? He’s (she’s) SO cute! Thank you very much for your tip. It’s time to do it for cutting mat too. Love these web sites. I am new at quilting and I enjoy it. Will work for most used cutting board. The crack itself will not heal fully. But this will lessen it/make it less hard. How long do you have to wait after soaking before your can use the mat? Thank you for the tip on cleaning the mat and removing the fibers!! I didn’t know about vinegar. Time to give my cutting mat some TLC. Can mats that have warped be flattened? How do you care for a really large cutting mat. I have no tub large enough for a 4’X6′ mat! Any suggestions? When you have a large cutting mat like this, you can still use the same technique for caring for your mat- you will just have to rotate the mat and work in sections (halves or quarters) to care for the entire mat. Do not put it in the sun to dry!!! Many thanks for the suggestions for flattening a warped mat!! I’ve hung on to mine hoping to find a solution. Thank you for writing about this I will share the article and its origin with my quilting group.this is such a good discussion around the group and now we finally have the answer! Hi, I did a reply further up on an old date of 2017th I think. Anyway, in case you don’t see it, I have a question. Since I’ve had my mat for over 10 years and it’s never been moisturized or soaked or anything since there were no instructions with it and the internet wasn’t a big thing too much then and no one where I bought the mat told me anything about caring for it, I didn’t really have any idea how to use it. So I guessed. Now it’s old but still in what I think is excellent condition, it’s still pliable and bright but it has some pretty deep cuts (actually a lot of deep cuts). Once I do this soak will the cuts disappear or will it always be covered with cuts? What else do I do to take care of it? Unfortunately those cuts will always be there. While doing the soak and caring for your mat can help prolong the life of it, at some point it is going to need to be replaced. Great idea! Thank you! So sweet of Baxter to lend a helping paw! Great instructions! My mat is 2nd hand so I will definitely try it. Did you notice there is a “cat Face” in the picture with your dog? It is directly below his front right paw. I am very new to quilting and enjoying the little I’ve done. My present project is one called “The Village”. Thank you for the info on “caring for your self-healing cutting mat”. Thanks for the upkeep info. What a find. Attempting to teach myself to quilt. Slow process. Why does Olaf say not to soak their mats? Are their mats made out of different materials? Thank you so much for that info! I work in a Walmart Photo Lab, and the cutting mat gets Alot of use! We have to lay mounted prints upside down to cut edge w rotary blade, the mat is scratching the images. I was wondering how you would suggest leaning a cutting board that’s attached to a backing which also has an ironing pad on the other side. I have a lovely, portable set which I’ve been using that I’d like to clean. What are your suggestions? Thanks for the tips! How is soaking plastic going to restore it, is make it supple? Isn’t plastic waterproof? Do you mean soak in vinegar to clean it? I have signed up for the news letter so many times I have lost count and have never once received anything and no it is not in my junk folder. I just tried again and received a message I am already signed up. I have put in a request to add your email address for our E-Newsletter. Please allow 5 business days for the change to process. If you are still not receiving the E-newsletter, please reach out to our customer service team at 1-855-706-3538 and they will help trouble shoot with you why you are not getting the E-Newsletter. Thanks for the simple solution for a dirty and cut mat. I’m going to try this today.